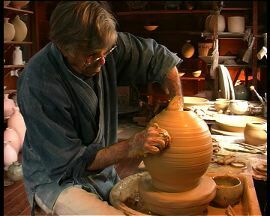 Playing with Clay 2010 is a 52 minute documentary on Peter Rushforth (AO). Playing With Clay is a lovingly crafted profile of the life and art of prominent Australian potter Peter Rushforth, known as a pioneer of ceramic art in Australia. Featuring the dramatic backdrop of the Blue Mountains landscape as inspirational to his work, it draws together themes such as childhood loss, the devastation of war and internment in Changi, forgiveness and the embracing of Japanese culture in pursuit of refining his own stunningly individual aesthetic. Culminating in a celebration of his pots and the food of culinary luminary Tetsuya Wakuda, this documentary is a soulful portrait of one of our foremost artists who inspires with his humility and dedication. This film shows the ceramic artist at work from the moment the clay is dug from the earth, through every stage of the process; kneading, throwing the clay, biscuit firing, glazing and firing in a wood fired kiln. 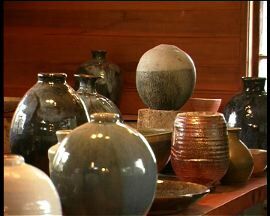 It shows the celebration of opening the kiln and exhibiting the glazed pots. In parallel with this is the moving story of a very gentle man who was drawn into the second world war, where he was a prisoner of the Japanese under the harsh conditions of Changi POW camp where he worked on the Burma/Thai railway. He came back to Australia wanting to put the destructive experience of war behind him and start a life of creativity in ceramics. This led him to appreciate the beauty of Japanese pottery and Japanese culture where he made many Japanese friends and colleagues, an ironic contrast to his war experiences. The film also expresses Peter’s very human values of the importance of creativity, a simple life of making and constructing from natural materials sourced close to home while embracing knowledge and culture from a worldwide source. Copies of Playing with Clay are available in DVD format - Contact Christina for more information. Copyright ©2010 Classic Theme. All rights reserved.